We have all heard the expression, “You will feel like a kid in a candy shop”. Yesterday I was that kid in the candy shop! Last night I came up with the grand idea to visit Roger’s Bulk Candy and Ice-Cream in Eastpointe, MI. As you may already know I often promote a healthy lifestyle and a healthy diet. I believe in living your life and having fun every once in a while though. I feel that eating should be all about BALANCE. I regularly opt for healthy meals but sometimes I like to just cut loose and enjoy whatever the heck I want. I heard about Roger’s Bulk Candy and Ice-Cream on the news just recently. I could not believe that I lived in the area of this place for so long and had no clue that it even existed. When you first step foot inside you will see an explosion of color, candy, and the huge variety of ice-creams that are available. This place just looks absolutely fun from the first moment that you get a peek inside. This place is floor to ceiling candy wherever your eyes looks. This was a very exciting excursion for my 8-year-old daughter, Chloe. We ended up going there on a whim and planned it out as a surprise for her. We did not tell her where we were going, we just drove over there. We had a blast walking around the store and looking at all of the candy that you can help yourself to. It is a bulk candy shop and the candy is sold by weight so you can buy as much or as little as you want. If your sweet tooth is calling, this is the place to be. Roger’s has been in business for 12 years now. They have over 500 types of candy and they have something for everyone. Seriously, if you have a problem finding a candy to take home with you then maybe you have a problem lol! Most of the candies here are nostalgic candies that date back to your childhood. Seeing these candies sure did bring in a tidal wave of memories! We ended up getting a little variety bag of sour candies. Then it was time to figure out what we were going to get at the ice-cream area of the shop. There is a huge assortment of ice-cream available and if you are seeking out something a little healthier, Roger’s does offer smoothies made with fresh fruit. We decided we would order a banana-split and share it. This was no ordinary banana-split either. We did not go with the basic vanilla, chocolate, and strawberry. We wanted a colorful, Instagram-worthy banana-split with some fun flavors. We chose Superman, cotton candy, and anniversary cake. We had the usual toppings on it: strawberry (on the Superman), pineapple (on top of the cotton candy), and chocolate (topping for anniversary cake). We really were not sure how this would all pan out but this really did come together as a memorable banana split that we all enjoyed! If you are local to this spot definitely stop in and give it a whirl! This was a wonderful experience for all of us. We also really enjoyed the helpful and friendly staff. 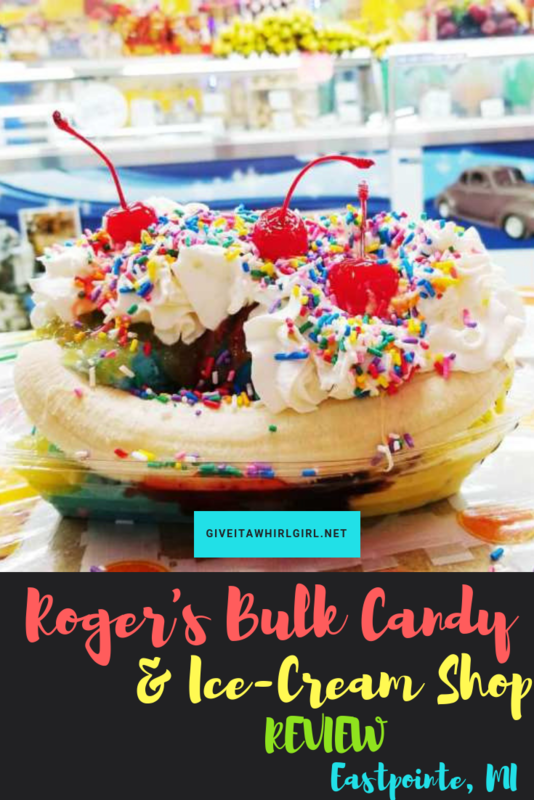 Roger’s Bulk Candy & Ice-Cream will surely put a smile on your face. What is your favorite kind of candy that takes you back to your childhood? My favorite has always been those little raspberry and blackberry candies. Leave me a comment below! This entry was posted in Local Spots I Visited, Uncategorized and tagged anniversary cake, banana split, candy shop, Chloe, chocolate, cotton candy, eastpointe, ice cream, ice cream shop, michigan, pineapple, rainbow sprinkles, restaurant review, rogers bulk candy and ice cream, strawberry, superman. Bookmark the permalink. I will always love all types of candy! It makes it hard for me now that I am prediabetic though. My favorite candies are mints, especially chocolate covered ones like Junior Mints. Second place comes Jelly Belly. I love all of their flavors except the Beanboozled ones. I guess you could say I ate a lot of candy in my 60 years! I have the fillings in my teeth to prove it! Lol! Next time you are in the area make it a priority to stop by over here. You won’t regret it!